You’ve likely heard me talk quite a bit lately here at Apprising Ministries about the insipid cult of the Word Faith movement slithering deeper into the mainstream of the church visible. As we moved into this new year the phenomenon I’m discussing received a huge boost from Elephant Room 2 courtesy of former Gospel Coalition members James MacDonald and Mark Driscoll. Notice first that James MacDonald said T.D. Jakes would not accept the WF prosperity preacher label. From over 25 years of studying that movement I can tell you that I’ve never yet seen one of them who would accept it. Then secondly, MacDonald is right when he says that if Jakes wants to be accepted as evangelical and not WF then “his ministry will have to bear that out.” However, since ER2 it most certainly hasn’t been the case. For example, I showed you the clip below in my June 12 piece WF Pastrix Paula White: As Paul Is To Timothy, So T.D. Jakes Is To Me. By the way, she just made that statement at Jakes’ 35th ministry anniversary soirée. Unfortunately, not much has been written about the cult of the Word Faith movement since the mid 90’s or so because people really haven’t thought it would make the inroads into the church visible that it has. So, I’m pleased to point you to now to the following video below from Justin Peters of Justin Peters Ministries. 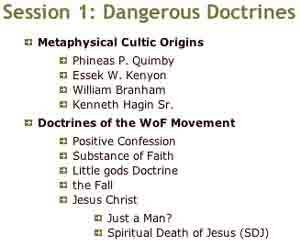 Peters does an excellent, and quite thorough, job in giving you an overview of WF’s key doctrines.